Ch. Pouch Cove's Sunday Best, "Abby"
Ch. Ad Lib of Pouch cove, "Ad Lib"
Pouch Cove's Southwind Sentiment, "Aiden"
Ch. Pouch Cove's American Maid, "Amy"
Ch. Season's Autumn of Pouch Cove, "Autumn"
Ch. Pouch Cove's Just Whistle, "Bacall"
Ch. Pouch Cove Remembers, "Beary"
Ch. Pouch Cove's Declaration, "Becca"
Ch. Kilyka's Aphrodite of Pouch Cove, "Berry"
Ch. Spillway Bery Pouch Cove, "Berry"
Ch. Kilyka's Becky Jo Of Pouch Cove, "Becky Jo"
Ch. Seabrook's Heirisistible Pouch Cove, "Bliss"
Ch. Nakiska's Bonus For Pouch Cove, "Bonus"
Ch. Pouch Cove's If the Shoe Fits, "Boots"
Ch. Seabrook Simply Stated Pouch Cove, "Brie"
Ch. Pouch Cove's Antares Arbitrage, "Britt"
Ch. Pouch Cove Calls the Question, "Callie"
Ch. Motion Carried of Pouch Cove, "Carrie"
Ch. Whalebone Carrie of Pouch Cove, "Carrie"
Ch. Pouch Cove Casts Its Vote, "Cassidy"
Ch. Moonshadow of Pouch Cove, "Corey"
Ch. Pouch Cove's Court Order, "Courtney"
Ch. Haven's Daybreak of Pouch Cove, "Crackers"
Goldcoast's Pouch Cove Presence, "Dani"
Ch. Spillway Devon of Pouch Cove, "Devon"
Ch. Darbydale's Pouch Cove Appeal, "Dru"
Ch. Twillingate Specialty of Pouch Cove, "Elle"
Ch. Pouch Cove's Window Dressing, "Emma"
Ch. Decembear of Pouch Cove, "Emmy"
Ch. Pouch Cove's Antares Fanfare, "Fanny"
Ch. Pouch Cove's Always In Style, "Fashion"
Ch. All in Favor of Pouch Cove, "Favor"
Ch. Pouch Cove's Goodnight Grace, "Grace"
Ch. Pouch Cove's Rosewood Gracie, "Gracie"
Ch. Mooncusser Color Me Pouch Cove, "Grayse"
Ch. 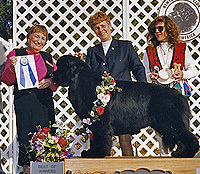 Pouch Cove's Antares BriteStar, "Haley"
Ch. Pouch Cove's Heritage, "Hattie"
Ch. Pouch Cove's On All Fours, "Indy"
Ch. Pouch Cove's Monday's Child, "Izzy"
Pouch Cove Engages The Spirit, "Jackie"
Ch. Jamboree of Pouch Cove, "Jamie"
Ch. Pouch Cove's Antares Underfoot, "Jayme"
Ch. Pouch Cove's First Class Numa, "Jemima"
Ch. Kilyka's Jessica of Pouch Cove, "Jessica"
Ch. Spillway Jessy of Pouch Cove, "Jessy"
Ch. Pouch Cove's Access Denied, "Joie"
Ch. Pouch Cove's Second Wind, "Jonesy"
Ch. Pouch Cove's Natural at Nakiska, "Joyner"
Ch. Mooncusser Kayla of Pouch Cove, "Kayla"
Ch. Pouch Cove's Celebration, "Libby"
Ch. Highland Fling of Pouch Cove, "Lilly"
Ch. Pouch Cove's Make A Wish, "Liz"
Ch. Pouch Cove's Make Believe, "Logan"
Tempest's Keep The Change Pouch Cove, "MacKenzie"
Ch. Call Me Madame of Pouch Cove, "Madame"
Ch. Pouch Cove's Legend Most, "Madison"
Ch. Pouch Cove's Ms. Margaritaville, "Maggie"
Pouch Cove's Spillway Reply, "Mallory"
Ch. Pouch Cove's Fonteyn, "Margot"
Ch. Pouch Cove's Presumed Innocent, "Marguerita"
Ch. Pouch Cove's Summary Judgement, "Mary"
Ch. Southwind Reflects Pouch Cove, "Mira"
Ch. Pouch Cove's Girl Most Likely, "Molly"
Ch. Seabrook Heireverent Pouch Cove, "Mona"
French Fries King of Helluland, "Monika"
Pouch Cove's I Am The Spirit, "Morgan"
Ch. Pouch Cove's Northern Spirit, "Naiomi"
Ch. Never Grow Up Of Pouch Cove, "Never"
Ch. Pouch Cove's It's All About Her, "Paige"
Ch. Numa's Party Line At Pouch Cove, "Party"
Pouch Cove's Material Girl, "Riley"
Ch. Keepsake of Pouch Cove, "Sage"
Ch. Pouch Cove's Salome of Tarbell, "Salome"
Ch. Antares Bewitched Pouch Cove, "Samantha"
Ch. Tis the Season of Pouch Cove, "Season"
Ch. Pouch Cove's Southwind Scenario, "Sloane"
Ch. Pouch Cove's Philosophy, "Sophie"
Ch. Pouch Cove's Objection Overruled, "Sterling"
Ch. Pouch Cove's Southwind Storyteller, "Story"
Ch. Mooncusser RSVP Of Pouch Cove, "Summer"
Ch. Pouch Cove's Southwind Summit, "Summit"
Pouch Cove's Southwind Susan, "Susan"
Ch. Pouch Cove's Southwind Solution, "Sutton"
Ch. Pouch Cove's Shiprock Sydney, "Sydney"
Ch. Pouch Cove's Muddy Creek Tess, "Tess"
Ch. Pouch Cove's Token, "Token"
Ch. Nakiska's Track Me Now Pouch Cove, "Tracker"
Ch. Pouch Cove's Treasure Chest, "Treasure"
Ch. Pouch Cove's Trips to Win, "Trips"
Ch. Spillway Tyler Of Pouch Cove, "Tyler"